Heather and I are back for chapter 4 thoughts. You can read Heather's thoughts here. Obviously, I loved this book enough to write a post on each chapter, but chapter 4 is where it really started to get good in my opinion! Chapter 4 is called "Squeezing the Juicy Words-Adding Synonyms and Antonyms. I always assumed I was doing enough when we would briefly chat about similar and opposite words for the weekly vocabulary words, but I never thought about making those such a big part of the week's vocabulary study. When I read this chapter, it made so much more sense that these words should be discussed and actually used in daily classroom conversation! The controlling teacher in me really wants to go ahead and fill out all the 3 column vocabulary charts with an official synonym and antonym for each vocabulary word, but essentially that's just giving them another vocabulary word. It is SO MUCH MORE effective to let the students collaborate and brainstorm their OWN synonyms and antonyms and have the class determine an official synonym/antonym for each vocabulary word. This allows them to take ownership of each vocabulary word. See the picture of that student recording the official class synonym for that vocabulary word....love! Another part of this chapter that I LOVED was the velcro and juicy words!!!!! Velcro words are more challenging words that stick to the students' brain! Juicy words are really interesting, impressive words. Doesn't that just make increasing your vocabulary more fun?? The last part of chapter 4 discussed Vocabulary Lanyards, which are actually shown on the cover of the book. I was immediately interested in these when I looked at the cover of the book, so I was glad they were mentioned in this chapter! I had never heard of the term "lanyard" before. Look at that! Words Nerds is teaching me new words! :) :) I've always called them badges, so that's what I'll call them in my classroom. 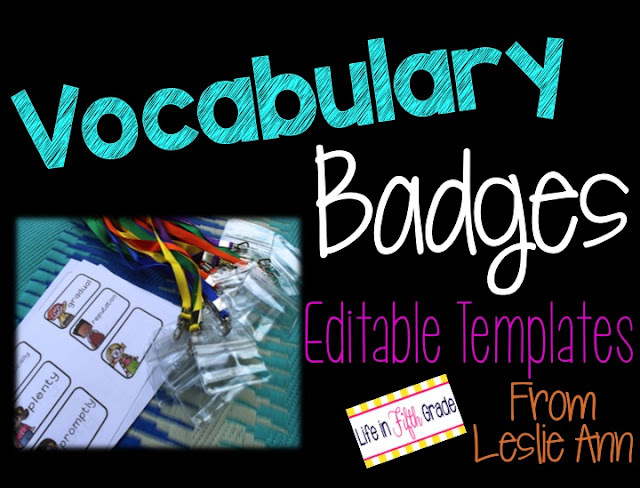 In the book, the two teachers have students wear a lanyard that contains a vocabulary word, synonym, or antonym during class. Groups are formed using these words as well as other activities. I loved, loved, loved this idea! I immediately headed to amazon to purchase my own lanyards! I'm so excited about using these next year! You can grab your free editable template to create these fabulous vocabulary badges here. Missed a post? Go back and catch up! I'll be back with chapter 5 thoughts Friday! Don't forget! 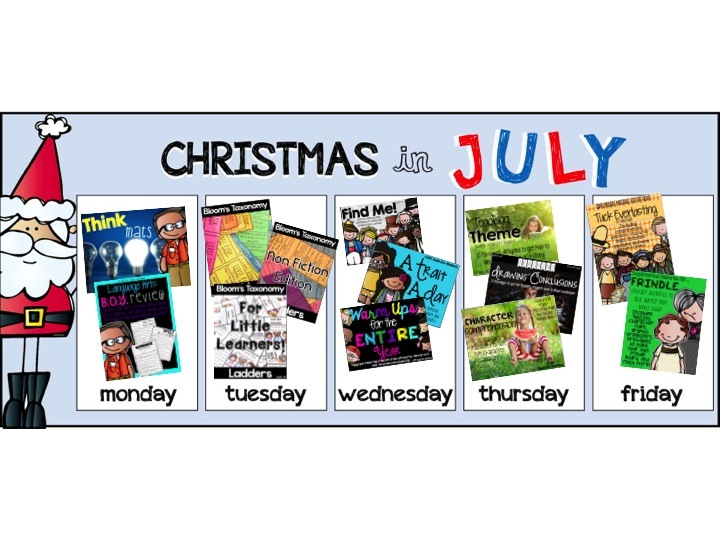 The Christmas in July SALE is happening in my TpT Store! Love this! I've had this book in my amazon cart for a while now - now I'm running over there to add lanyards to my cart and pull the trigger! Vocabulary instruction is soooo important and it's been really difficult figuring it out what works best. 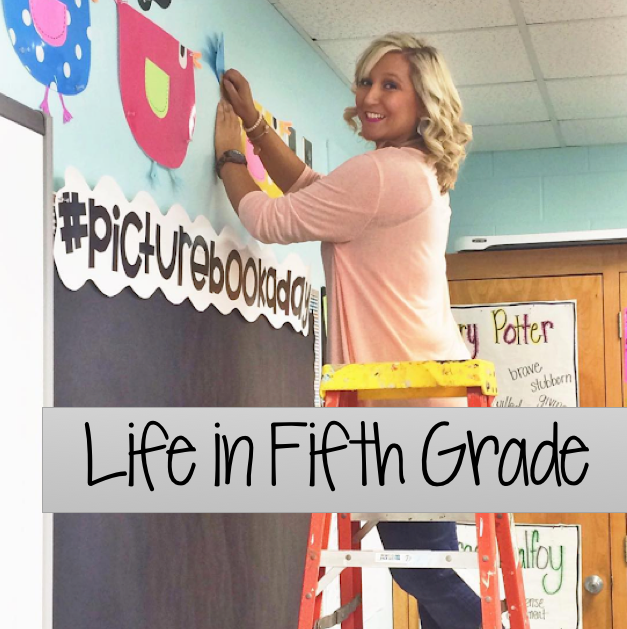 This post reminded me I need to get out to my classroom and grab my book to review! I read Word Nerds last year and it changed my world and classroom! My kids LOVED using the vocab lanyards!!!! I LOVE your freebie!!!! So much cuter than what I was using !!! Thanks so much for sharing! Thank you for the freebie. I have Word Nerds on order because of your posts. You are very inspiring! As I was reading the suggestions for intermediate grades coming up with their own synonyms and antonyms I was automatically drawn to Padlet. Students could post their thoughts as individuals or groups (depending on available technology). The teacher could screen shot it and post it to the class website. Then students could select their words for the cycle. It's always nice to incorporate technology where you can. I love this book thanks to you! I have been reading all of your posts and decided I just needed to get the book myself. So, I did and I have caught up on my reading. You can check out my posts and how I am going to integrate vocabulary instruction in my 4th grade classroom this coming school year. I also just purchased the lanyards and badge holders on Amazon. Can't wait to get started! Thanks for sharing. I hope you will check out my post on my blog. I love lanyards!! My husband attends many conferences and conventions with his job. I always have him keep his badges for me to reuse. I use them for hall passes too. The idea of handheld hall passes all over the floor of a middle school restroom is too much for this gal.